To further cater for public-space and day cleaning each the SCG1805AT is available with the added safety and security of lockable doors. The construction of both models is our well established Structofoam specification equipped with 200mm (8”) heavy duty super quiet castors equally suitable for outside use together with rotating corner buffers and soft side wall protection. • 120 Litre Waste Capacity – Fully lidded providing excellent capacity for normal waste collection and disposal. Folds down for compact storage. • All-Terrain Castors – 200mm heavy duty super quiet castors equally suitable for inside or outside use. • Choice of Mop Kits – Compatible with 6 additional kits, providing the right mop for the right cleaning task. 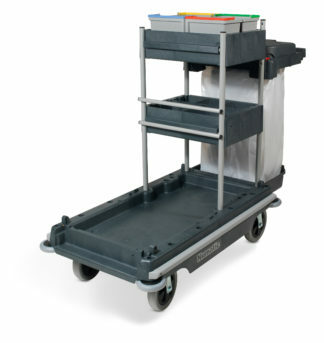 • Lockable Door Option – Provides added safety and security when you want to keep the contents of the trolley out of sight and out of reach. • Structofoam Construction – The heavy duty Structofoam base is strong and resistant to scratches and dents. • Shelf Storage – Store a wide variety of cleaning items. • Optional Fixed Floor Sign – Essential for carrying out cleaning in public spaces.